Combine the garlic, thyme, and oil. Set aside. Peel the yuca and cut it in "steak fry" 3x1/2x1/2-inch strips. Boil the salted water in a large soup pot, add the yuca, and cook for 30 minutes. 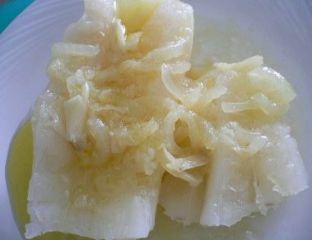 Do not overcook; the yuca should have a firm texture. Drain and pat dry with paper towels. Heat the oil in a heavy skillet. Saute the yuca until golden brown. Drain on paper towels. Arrange the strips on a platter, and pour the garlic oil over the "fries."